Provide comfort for the family of Ronald Gamber with a meaningful gesture of sympathy. GAMBER – Ronald Erick, 50, Somerset, died March 15, 2019 at Conemaugh Memorial Medical Center as a result of an automobile accident. Born November 9, 1968 in Johnstown. Preceded in death by father Ronald E. Gamber. Survived by mother Delores A. (Sehn) Foust; sister Linda Olsen and brothers Shawn and Sam Gamber and many loving aunts, uncles, nieces, nephews and cousins. A 1988 graduate of North Star High School. Currently employed at Roady’s Somerset Travel Center and was a longtime employee of Giant Eagle, Somerset. Long time supporter of Humane Society of Somerset County. Erick enjoyed fishing and riding and working on his motorcycle. A celebration of life service will be held 6PM Monday, March 18th at Somerset Church of God, 1020 W. Main Street, Somerset. 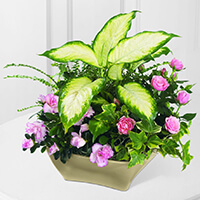 Arrangements by Hoffman Funeral Home & Cremation Services. In lieu of flowers, donations in Erick’s memory may be sent to Humane Society of Somerset County, PO Box 182, Somerset, PA 15501. To express condolences, make a donation or plant a memorial tree, visit HoffmanFuneralHomes.com. To send flowers in memory of Ronald Erick Gamber, please visit our Heartfelt Sympathies Store. Donations are being accepted for: HUMANE SOCIETY OF SOMERSET COUNTY. Sue, Marci, Tyler, Sarah purchased the The FTD Garden of Grace Planter for the family of Ronald Gamber.